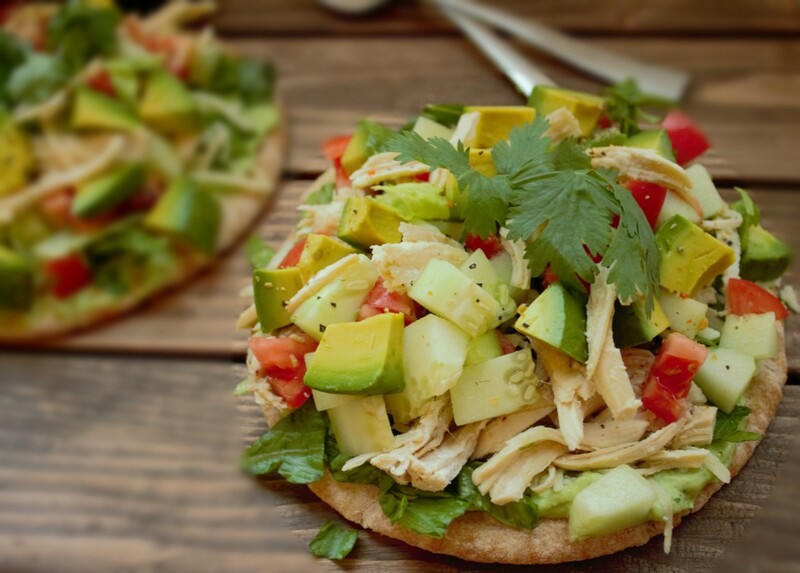 An easy pita pizza made with a cilantro-avocado sauce topped with romaine lettuce, chicken, tomatoes, cucumbers, avocado, and cilantro. A dinner ready in less than 30 minutes! This recipe doesn’t require you to make a dough!!! For this pizza, I used pita bread warmed up on my panini grill. I’m sure you could also microwave the pita bread for about 10 seconds or warm it up over medium heat in a skillet over the stove-top. Or if you want, you don’t even have to warm it up. This recipe is highly adaptable! As far as toppings go, feel free to change them up to what you like or don’t like. The great thing about making your own pizza is you don’t have to add the nasty toppings that come on pre-made pizzas. (Olives–I’m talking about you!) And, if you are following a vegetarian diet-just leave out the chicken. And one last note–the spread that goes on these pizzas–to die for! It is so good that you might have to make it and then leave the room while someone else spreads it on the pita bread. Otherwise, you might not have any spread left. It’s that good. Since I was only making dinner for my husband and I, this recipe reflects the toppings for only two pizzas. But you can easily double, triple, or quadruple the topping ingredients listed below. An exception is the spread which makes enough for about 6-8 pizzas (if you don’t eat spoonfuls of it first, that is.) If you aren’t going to use all of the spread for pizzas, it makes a great dip for chips and/or cut up vegetables. In a blender or food processor, combine all of the ingredients for the Avocado & Cilantro sauce. Blend until the spread is smooth. Prepare the vegetables-chop the tomato, avocado, and cucumber into small pieces. Shred the lettuce and cheese. Spread the sauce over the pita bread. Add the veggie and chicken toppings. Enjoy immediately.